A reading from the gospel of John 18:33-37. We break into the portion of the gospel of John when Jesus has been brought before Pilate to be condemned to crucifixion. Already Pilate has been outside to talk to the religious leaders who have brought Jesus to the local Roman ruler. And Pilate has wondered if this man isn’t innocent. He returns to his headquarters to speak to Jesus directly. Listen for God’s word to us. Anyone who’s ever spent time with stories from the gospels likely recognizes how odd things seem. 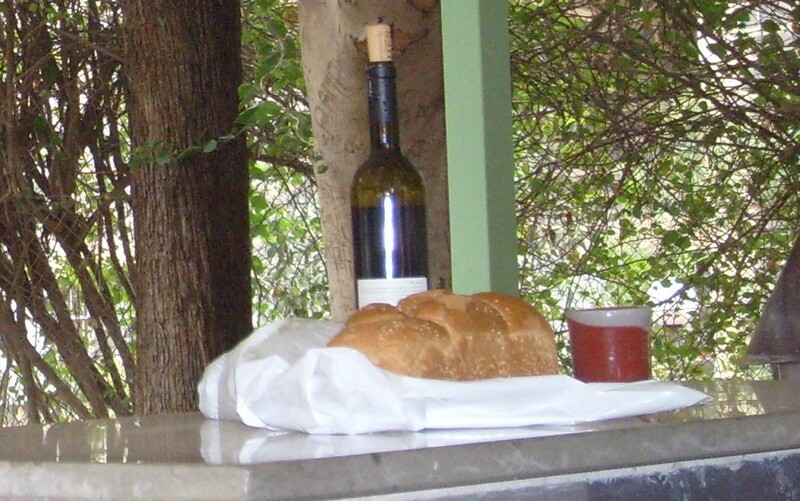 In stories recorded in the gospels of Matthew, Mark, Luke, and John; Jesus does things like sit down to eat with those despised as outsiders. Heal-with-a-touch people considered unclean, untouchable by religious law. Welcome women, children, and others – even those from other nations – all who were hailed as less than in Jesus’ day. Not to mention, forgive those violently taking his life, as even in death he remains grounded in the way of non-violence. If we stop to read the gospels – and know a thing or two about the times in which Jesus lived, then we begin to see behavior in Jesus and in his first followers that may look quite different from what’s too often seen today. We may look at the stories of Christ and his first followers and think: “Wow! It’s behavior, practices, acts – from truly beyond this world! It’s Christ the King Sunday – the final Sunday of the liturgical year – the culmination of the cyclical story that takes us in Advent through the waiting, waiting, waiting for God to act among us in a new way, to the in-breaking of Christ as a baby in Bethlehem, to his radical way of living among us which led directly to his death but could not be the end for a God who is Life and would start something amazing among us through the Spirit, so that we would grow together in this world to walk that same radical path of love. Today we remember Christ is King! He reigns supreme with the strongest power known in the universe. Not force, in which the powers of this world put all their hope; but love. This year in the scriptures assigned by the lectionary for Christ the King, we’re taken right to the judgment seat of Pilate. Here in the gospel of John a seemingly private conversation between Jesus and Pilate is recorded. It might be helpful to remember that John is the latest written gospel and it begins with that beautiful poetry of “In the beginning” (John 1:1-14). There was God. There was Word. There was Spirit and the outflow of their love created the world. The continuing outflow of their love caused it to be that Word would take on flesh to dwell among us. . . . Jesus attempts to explain this to Nicodemus when Nicodemus comes to him in the shadow of night trying to understand what Jesus might be up to. As the gospel of John records the story, it’s the first teaching of Jesus and it begins like this: “Very truly I tell you, no one can see the kingdom of God without being born from above” (John 3:3). If you’re scratching your head going: “Huh?” Don’t be alarmed. Supposedly Nicodemus was a part of those who devoted their whole lives to understanding God and he’s just as confused as the next. In her book entitled The Wisdom Jesus: Transforming Heart and Mind, Cynthia Bourgeault makes the case that Jesus isn’t just the Savior of the world – here to die and be raised to new life for us, as we’ve primarily come to emphasize in the Christian tradition of the West. Jesus also is a wisdom teacher – one among us to perk our consciousness that we might come to know how to live. How to follow the path of his Way. It’s why so much of what Jesus teaches is hard for us to grasp. People seek to take him at face value like he’s a teacher who rattles off fact after concrete literal fact. When wisdom teachers speak, according to Bourgeault, “pithy sayings, puzzles, and parables” all for the sake of the transformation of the human being (The Wisdom Jesus, p. 23). Bourgeault points out that much of Western Christianity has seen the kingdom of God in one of two different ways. She writes: “A lot of Christians . . . assume that the Kingdom of Heaven (or of God) means the place where you go when you die – if you’ve been good.” . . . Others “equate the Kingdom of Heaven with an earthly utopia . . . a realm of peace and justice, where human beings live together in harmony and fair distribution of economic assets” (Ibid., p. 30). I’ve heard of both, haven’t you? In fact, one or the other, or both, seem the concern of Pilate. He’s Rome’s representative in Jerusalem, after all. If Jesus is a King, he needs to know if his Caesarea has anything about which to be worried. As Jesus stands before Pilate, he’s asked: “Are you the King of the Jews?” (John 18:33). In the vein of a true teacher of wisdom, Jesus turns back the question on the questioner: “Do you ask this on your own, or did others tell you about me?” (John 18:34). He might as well have been saying: “What do you think, Pilate? You see the leaders out there wanting to do me in. Am I the King of the Jews?” Insisting Jesus reveal his crimes, Jesus finally tells Pilate: “My kingdom is not of this world. That’s easy enough to see or else my followers would be here storming the gates to free me. Using the very same force upon which Rome and the powers of this world rely” (John 18:36). I wish the gospel writer would have used a word other than the same one used in the rest of the gospel of John. Like when John records: “The Word was in the world, and the world came into being through him . . . And for God so loved the world” (John 1 & 3). I wish the word recorded by John on Jesus’ lips before Pilate would have been the word society. Culture. Even way, as in: “my kingdom is not like your way.” Anything to keep us from thinking that Jesus wants nothing to do with the physical stuff of this world. Too long Christian history has abused the physical in this world due to misguided understandings of God. After all, if spirit is all that is good and matter is all bad, how can we claim God created physical matter? This beautiful earth with all its creatures including us, who are an interesting elixir of heaven and earth, spirit and matter, in-fleshed people of God. If the world is all bad and the spirit is all that is good, then certainly God wouldn’t have taken on our physical flesh in Jesus the Christ. . . . Because God took on our flesh and blood; in Jesus God could wake up each day in a home with parents around him, and feet to put on the ground, and taste buds to take-in that first sip of whatever it was he’d drink every morning. And finally had ears to hear the sweet songs of the birds. And muscles to feel the strain of physical labor – the wood and tools in his hands as he worked alongside his dad. Jesus could feel the hot sun on his back as they built. And notice the beautiful colors as it began to set each night. He had a brain to think and try to keep calm. And a heart beating in the center of his chest with which he could feel the full range of human emotions. I do believe that if God didn’t value the physical stuff of this world – including all the stuff of human flesh, then God never would have chosen to be in-fleshed among us in Jesus the Christ. But, as the gospel of John so beautifully reminds: God so loved this world; that God, in Christ, came to us in a new and wonderful way! (John 3:16). While it is true that Christ’s kingdom is not of this world in the sense of the norms, rituals, and values of so much of our society. Nonetheless, it is right here and now; in this world. Jesus says it himself when elsewhere the Pharisees ask him when the Kingdom of God will arrive. Luke 17:20-21 records his answer as: “The kingdom of God is not coming with things that can be observed . . . for in fact, the kingdom of God is within you.” In Putting on the Mind of Christ, Jim Marion interestingly concludes that the kingdom of God might just be “a metaphor for a state of consciousness . . . a whole new way of looking at the world, a transformed awareness that literally turns this world into a different place” (The Wisdom Jesus, pp. 30-31). Hear that again: the kingdom of God might just be “a metaphor for a state of consciousness . . . a whole new way of looking at the world, a transformed awareness that literally turns this world into a different place” (Ibid.). An awareness that sees no separation between God and humans, and humans and other humans. It’s a Oneness. A mutual indwelling, about which Jesus tells his followers a few chapters earlier in the gospel of John when they gather together that fatal night. He tells them: “I am in my Father, and you in me, and I in you . . . abide in me” (John 14:20; 15:4). When we’re aware of that kind of oneness – when we’re living that kind of unified sense, then indeed the kingdom of God is in us. Then, and maybe only then, can we be about the behaviors of Christ’s way. Putting into practice things like expanding our table fellowship because God in Christ ate with the despised of the world. Maybe as we take on the consciousness of Christ our King, we can sit with people in pain to help heal them too just like God in Christ did. Perhaps we could enact gracious welcome of all – including men and women and children of every race and tribe and ability because God in Christ certainly did. Perhaps we could put down the weapons of war and for once understand that the most powerful energy in the world isn’t force, but love. Because in Christ, God showed us this Way. The Truth which always leads to Life. It’s Christ the King Sunday. The day we celebrate the One whose Way is not like the ways of this world. Whose Truth looks differently than the lies we’re encouraged by this realm to live. When we finally get that, his reign expands in us for the Kingdom of God to be seen through us! Blessings for Christ the King Sunday, children of the King! May he reign in us all forever! This entry was posted in Sermons and tagged Christ the King, Christ the King Sunday, Cynthia Bourgeault, John 18:33-37, Kingdom of God, Putting on the Mind of Christ, The Way of Christ, The Wisdom Jesus, The World on November 26, 2018 by RevJule.